OSU has a 19-8 edge on the boards and 14-0 edge on pts in the paint. #Badgers getting outworked. Rebounds: Tate 10, Tate's teammates 9, #Badgers 9. #Badgers had 21 offensive rebounds in first meeting and won battle in the paint, 42-22. Not tonight. When your senior PG fouls a three-point shooter, you have issues. Points in the paint: Ohio State 16, #Badgers 2. Halftime: Ohio State 44, #Badgers 31. Koenig becomes UW's all-time leader in 3-pointers with that last one. But a poor half for UW. #Badgers Koenig closes half with a 3 (he has 14) and UW down 44-31. Worst half I can recall. Ugly all over. Ohio State outrebounded UW 23-12 and had a 18-2 cushion in points in the paint. 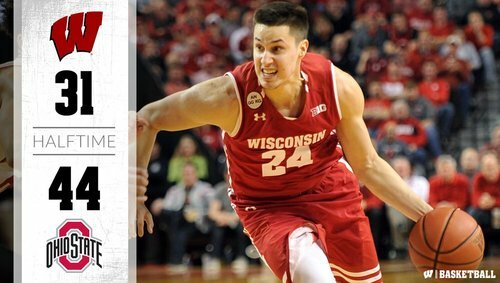 Bronson Koenig is now the all-time leader in 3-pointers for Wisconsin. That is the only good thing that happened in the first half. Koenig: 4 of 7, 14 points. PPP: Ohio State 1.33, #Badgers 0.91. That's the No. 72 KenPom offense destroying the No. 7 defense, by the way. #Badgers have come back to win 5 games when trailing at the half this season. C'mon fellas, let's make it 6. Let's get the #Badgers to, uh, #progresstothemean this half! Showalter picks up his 3rd foul 44 seconds into the second half. Stay hot BK... stay hot. Bronson Koenig is good at shooting threes. UW was within nine, but Ohio State leads 52-41 with 15:30 left. Koenig up to 19 points. Bronson Koenig is leading all scorers with 19 points for the #Badgers , including 5-for-8 3FG shooting. Ohio State is making shots -- they have no business making. They'll start missing soon. Do the Badgers have enough will to keep at it? Koenig has already equaled his season high with 21 points. The amount of preposterous shots OSU has made with the shot clock winding down is mind-boggling. Bronson Koenig has matched a season-high 21 points (7-11 FG, 5-8 3FG). Trevor Thompson picks up his 4th foul with 11:15 left. Trevor Thompson has 4 fouls? Time to go to work, Ethan. UW gets it down to 9. Two possessions later, the deficit is 15.